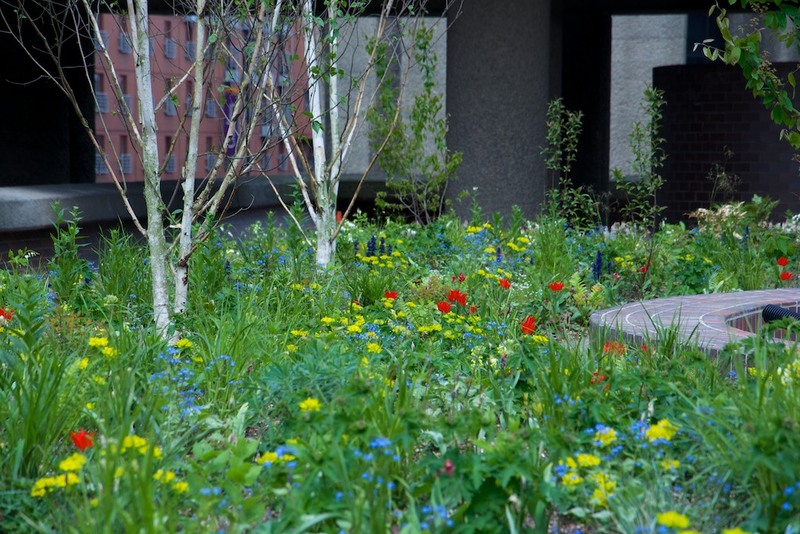 The rooftop woodland area at The Barbican is an area of ‘open woodland’ with a multi-layered structure: widely spaced multi-stem trees, a scattered shrub layer, and a rich and diverse herbaceous or ground layer. 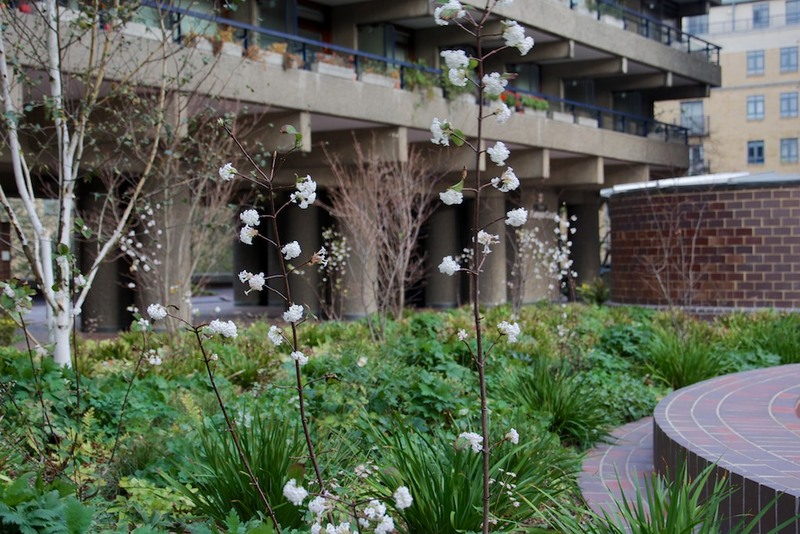 The design of the new Barbican plantings was partly based on a microclimate analysis that indicated which areas received full sun, and which received part-shade. It was only possible to position trees over certain points where the underlying building support columns enabled sufficient depth of growing medium to be placed. This placed a great limitation on the numbers that could be used, and how far apart they could be placed. Luckily the area that could take the largest number of trees coincided with the area that was naturally more shady. 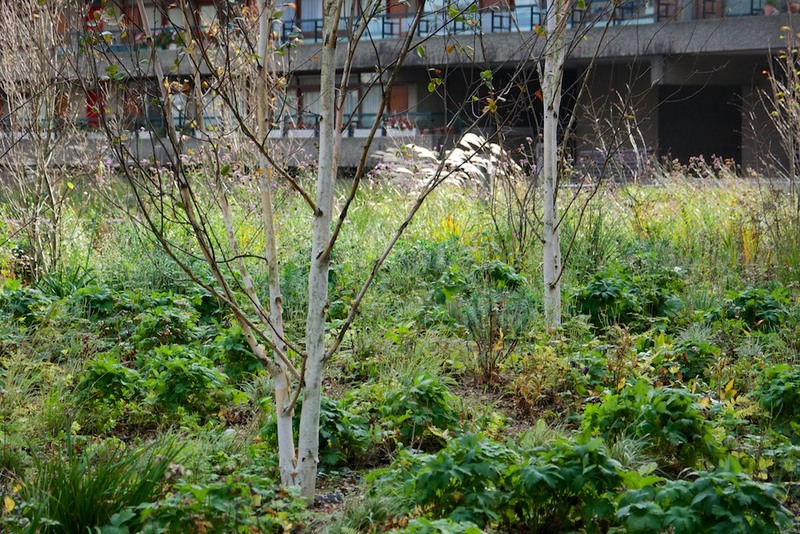 To bring light into this dark area, the main tree that was used was Betula jacquemontii. Loading restrictions, and the exposed nature of the site meant that tall trees could not be used, and therefore multi-stemmed birches were used. The shrub layer was simple: Viburnum x bodnantense ‘Dawn’ was used for its winter colour and scent. These were widely spaced throughout the area. A small number of Mahonia x media ‘Winter Sun’ were used to provide an evergreen foil for the birches, and again for their winter scent. Groups of Euonymus ‘Red Cascade’ were also included for their autumn foliage and bright fruits. The herbaceous layer was the main focus of the design. The intention here was to have an evergreen matrix of ferns, wood rushes and other foliage, and within this to have a succession of flowering from spring through to autumn. 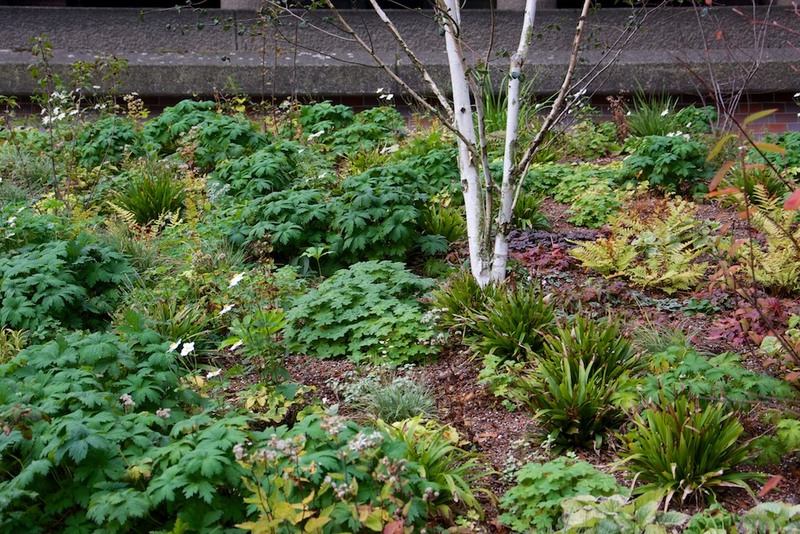 Because of the dark and shady character of this zone, many white flowered plants were used. The woodland area is sited in the shadiest part of the site. 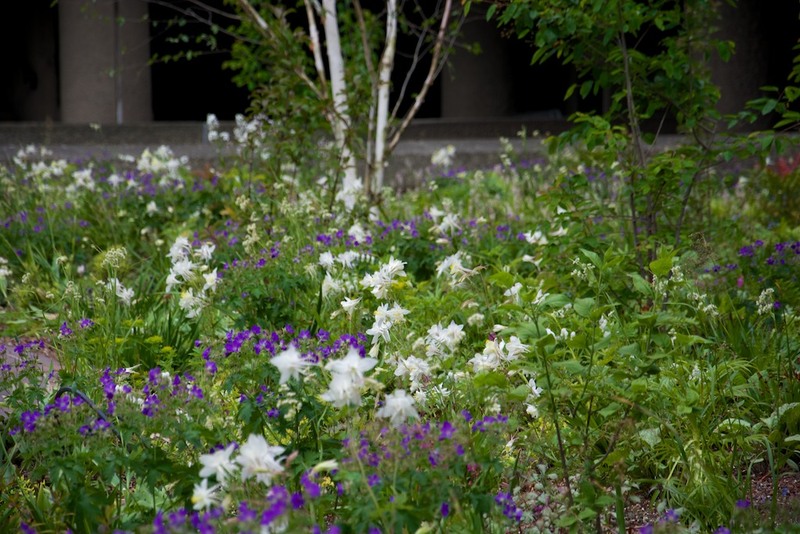 To bring light into this shady area, the majority of the flowering plants are white flowered. In late spring and early summer many of these plants come into full flower. White Aquilegia vulgaris ‘Nivea’, white Sweet Rocket, Hesperis matronalis ‘Alba’, and the Snowy Wood Rush, Luzula nivea, are all at their peak now. Mixed in are dark purple-blue Geranium sylvaticum ‘Mayflower’. 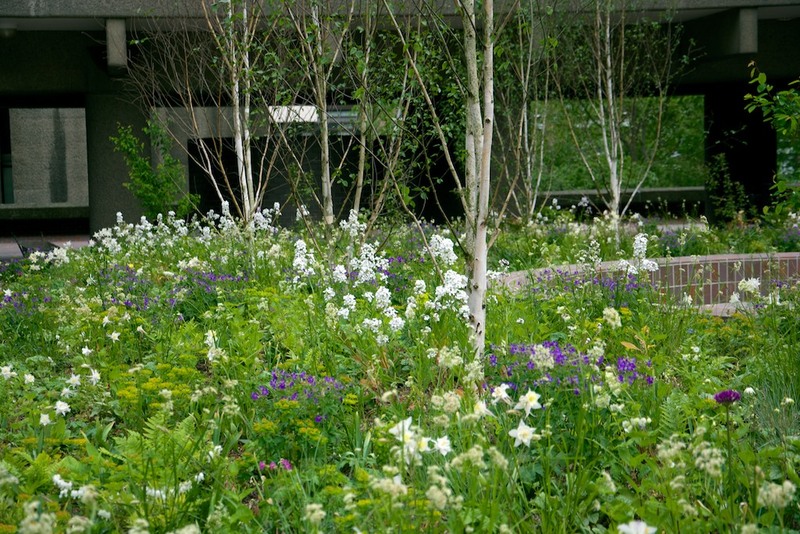 The Snowy Woodrush, Luzula nivea, with white Sweet Rocket, Hesperis matronalis ‘Alba’ with Geranium sylvaticum ‘Mayflower’ and the faded Euphorbia polychroma in May and early June. 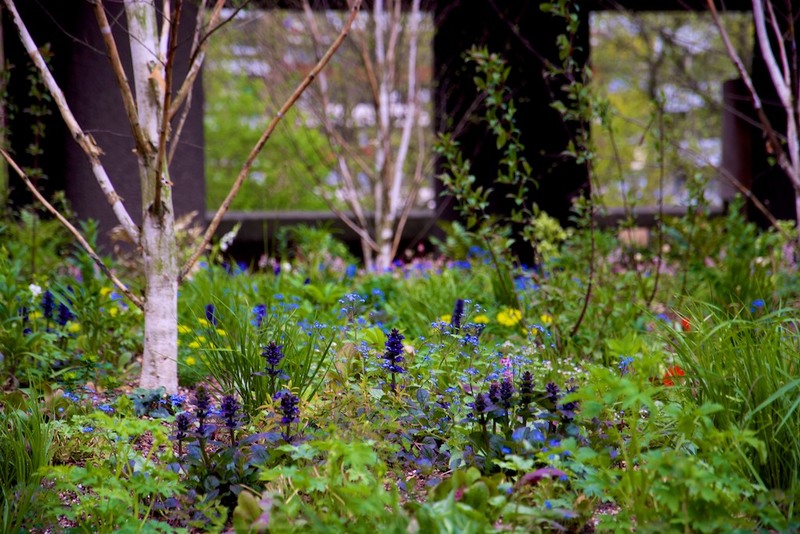 The Barbican woodland matches a semi-natural woodland in that there is a spectacular spring and early summer flowering display from perennials and bulbs and then over the summer, the ground flora becomes more subdued. Where this woodland differs however, is that in the autumn there is an almost equal perennial flowering display to that of the spring. 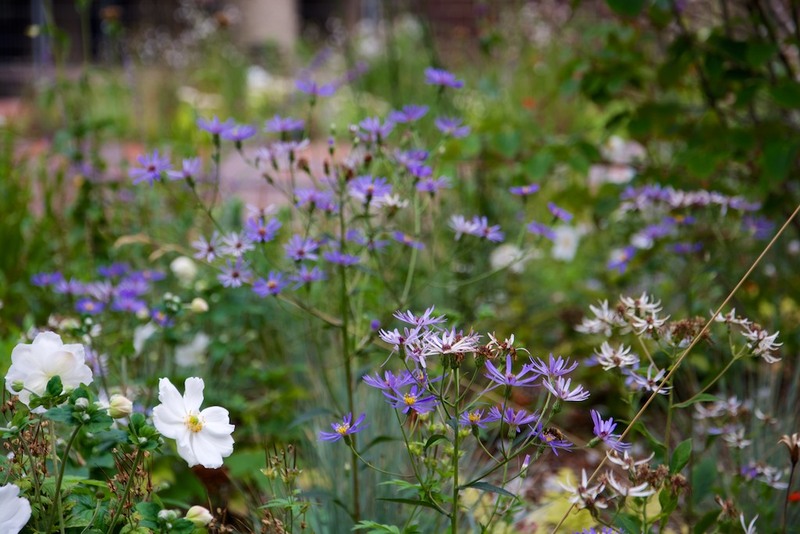 White Japanese Anemones, and white and blue North American Wood Asters have their main flowering season. Beneath the trees, clumps of Cyclamen hederifolium flower, and the grasses and ferns turn yellow and orange. The shrub layer of Viburnum x bodnantense ‘Dawn’ flowers at this time. In 2015, as a result of the exceptionally mild autumn and early winter, these were in full flower in the middle of November. 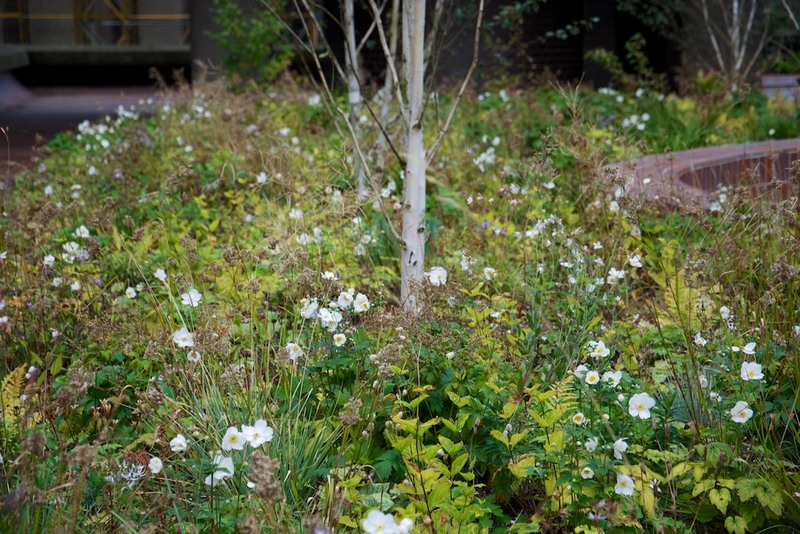 Above: In October, the ground layer is full of colour with white Anemone ‘Honorine Jobert’ amongst the foliage of grasses and ferns. 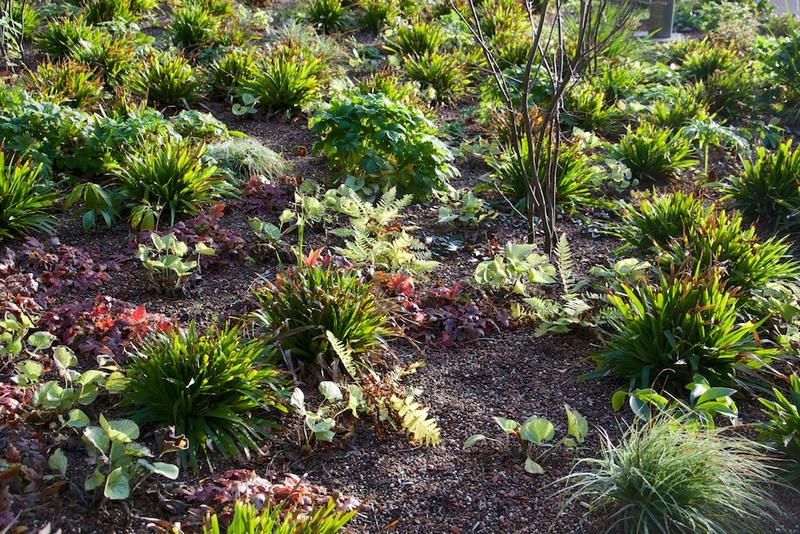 The herbaceous ground layer in late autumn and winter contains many evergreen species and plants with attractive winter foliage or form. In winter, the combination of yellowing and browning foliage of the ferns and grasses combines with the evergreen rosettes of the common wood rush, Luzula sylvatica. 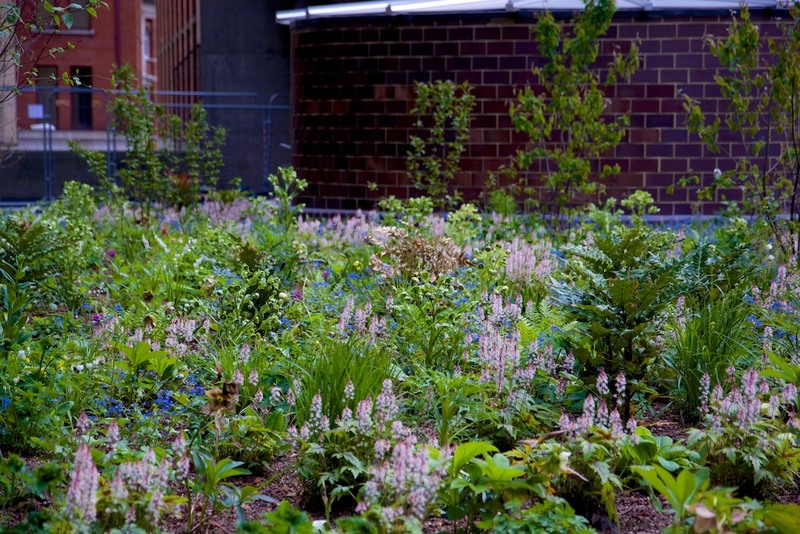 In the early winter, there is still the pale foliage of the perennial forget-me-not, Brunnera ‘Jack Frost’, while the foliage of Tiarella ‘Spring Symphony’ turns to bright pinks and purples.